Initiative would repeal 1987 law barring state and local police agencies from assisting in federal immigration enforcement; foes argue that repeal would rekindle racial profiling against minorities. Both sides have geared up their campaigns for and against Measure 105, which would repeal the 31-year-old prohibition on state and local police from assisting in federal immigration-law enforcement. Opponents, who launched their effort Saturday, say voter approval of the measure on the Nov. 6 statewide ballot would rekindle racial profiling in a way Oregon has not seen since the original law deterring it was passed in 1987. Supporters say that repeal of the 1987 law would enable state and local police to cooperate with federal Immigration and Customs Enforcement officials. The current law does allow police to check the immigration status of someone arrested for another crime, and county jails do release lists of foreign-born inmates to the public. 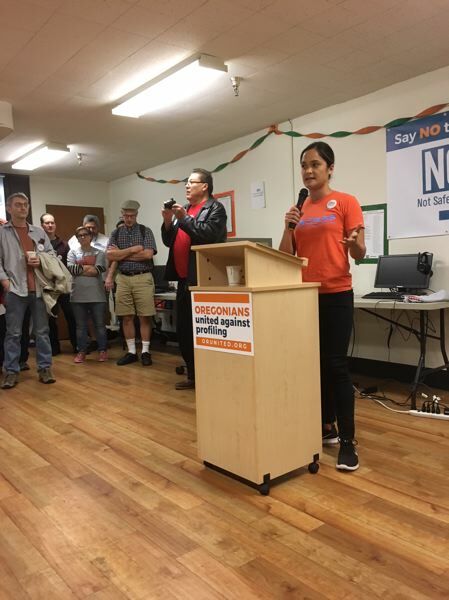 Opponents began their campaign with voter outreach efforts in several cities, including Portland, where more than 150 volunteers gathered at the Oregon AFL-CIO offices before they canvassed neighborhoods. "Voters are starting to pay attention. We have less than 50 days until the election," said Andrea Williams, leader of the official No on 105 campaign and executive director of Causa, Oregon's immigrant rights group. "This is a really critical time for us to start talking to voters." One of the volunteers was Dominic López, who is half Puerto Rican, and who grew up in the Summerlake area of Tigard that abuts Beaverton. "It is hitting me in a personal way that I did not expect and I am not used to," said López, whose father owns his own home in Tigard and is from Puerto Rico, a self-governing U.S. commonwealth whose residents have had automatic U.S. citizenship since 1917. "He has told me stories about being outside working in the yard, gardening, doing homeowner stuff like putting up a new fence — and being stopped by random passers-by or solicitors asking if the homeowner is home," López said, based on their false assumption that his father is a hired hand. "That is the experience of someone who is a citizen, speaks fluent English, and has a home and resources. I cannot imagine the experience of someone who is actually working as a gardener." Cynthia Kendoll of Salem is president of Oregonians for Immigration Reform, which supports Measure 105. She said in written testimony to the Clty Club of Portland that Measure 105 would "not turn local police into ICE agents; it only allows much-needed cooperation which ICE should have and does not have now in Oregon." Sixteen sheriffs, mostly from smaller rural counties, support Measure 105. But Sheriffs Mike Reese of Multnomah County and Pat Garrett of Washington County oppose it. 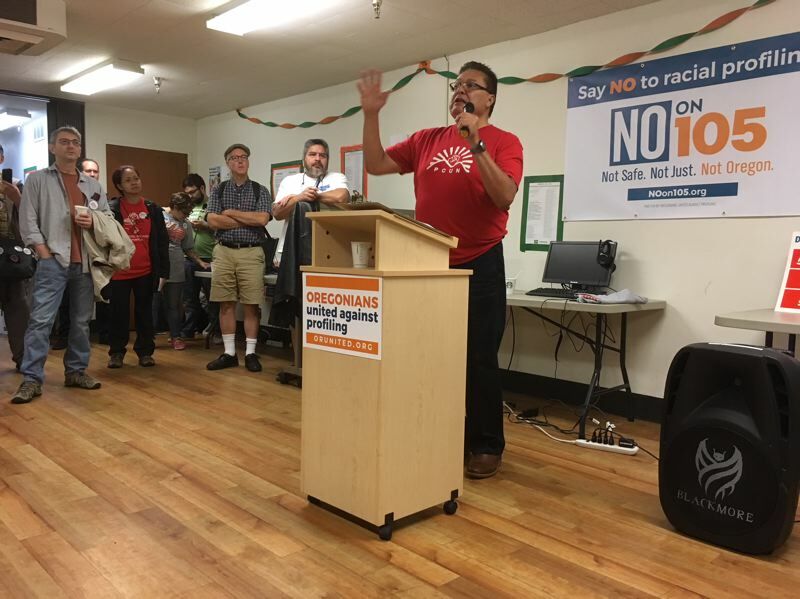 Ramon Ramirez is president of the Oregon farmworkers union known by the Spanish acronym PCUN. He said one reason for the union's founding in 1985 was to resist indiscriminate federal immigration raids — aided by local police — that often were based on skin color. He recounted one such raid in the early 1980s in Woodburn, which today is Oregon's largest Hispanic-majority city. Ramirez said those raids prompted him and others to ask Rocky Barilla, then a newly elected Democratic state representative from Salem, to sponsor House Bill 2314 in the 1987 session. Barilla was the first Latino elected to the Legislature. The bill passed with just one "no" vote each in the House and Senate. California and Washington now have similar laws in effect. "Back then, if you were foreign-looking, you were asked for your documents. There were many cases of people who were asked for their documentation who were U.S. citizens," Ramirez said. "We are not going back to those days, are we? Is that the kind of America we want to build? We want to be free from that." However, 30 years later, an extension of that ban to all public agencies in Oregon — the ban in House Bill 3464 wrote into law an executive order issued by Gov. Kate Brown — passed the Legislature on a party-line vote. Measure 105 was sponsored by three Republican state representatives, Greg Barreto of Cove, Sal Esquivel of Medford and Mike Nearman of Dallas. Oregonians for Immigration Reform, which supports Measure 105, sponsored a successful 2014 effort to overturn the 2013 Legislature's approval of driver cards for people who cannot prove legal presence in the United States. "Driver's licenses are different from a law that basically prevents racial profiling in our state," Williams said. "We have a lot of Oregonians who are energized behind this. We have our work cut out for us. We have to talk with voters. We have to get people involved." A independent survey, conducted with 680 likely voters Sept. 12-13, indicated 31 percent support and 50 percent opposition for Measure 105. The survey was first reported by Oregon Public Broadcasting. The margin of error is plus or minus 4 points. Kendoll of Oregonians for Immigration Reform disputes the poll findings, given how the group prevailed in the 2014 measure. According to U.S. Census averages for 2012-16, 9.8 percent of Oregonians were born outside the United States — and those figures are 8 percent in Clackamas County, 13.9 percent in Multnomah County, and 17 percent in Washington County. Both sides acknowledge the political dynamics are different this time. In 2014, supporters of driver cards had to persuade voters to cast "yes" votes, with opponents against it. This time, supporters of the 1987 law seek to persuade voters to oppose Measure 105 — and preserve the status quo — while opponents must urge a "yes" vote. Ramirez said the outcome also could hinge on how voters perceive President Donald Trump, who has criticized immigrants — and not just Latinos — and backed down from his own policy of separating undocumented children from their parents in federal detention camps. "People want to do something about the madness that is going on to stop the policies that separate families and encourage discrimination against people of color," he said. "It struck a chord with people's psyches." Ramirez acknowledged the continued existence of racial profiling, defined as the use of race or ethnicity to suspect someone of an offense. But Williams said that passage of Measure 105 would make things worse. "We must defeat this ballot measure, because if this (1987 law) is repealed, it means that Oregonians could be singled out doing daily activities simply for how they look, the color of their skin, their accent or perceived immigration status," she said. "That is not OK. That is not who we are as Oregonians." NOTE: This version adds written comments from Oregonians for Immigration Reform, which supports Measure 105, and adds context on law enforcement support/opposition and a subsequent 2017 law extending the ban to all public agencies in Oregon.